On December 16, 2014, terrorists attacked the Army Public School Peshawar, as a result of which 149 people – mostly school children and teaching staff – were martyred. The shock of this horrific incident was felt in the entire world, and compelled the civilian and military leadership of the country to take every possible action to dismantle this menace permanently. In this context, the very next day the Prime Minister of Pakistan lifted the moratorium on death penalty in terror-related cases, with the approval and consensus of other major political parties. On December 24, 2014, an All Parties Conference (APC) meeting was held in Peshawar, chaired by the Prime Minister Mian Nawaz Sharif himself; the meeting concluded with a unanimous agreement by all political parties on a twenty-point ‘National Action Plan (NAP)’ to curb the threat of terrorism from the country. Up till June 16, 2015, more than a 100 inmates that had been convicted by the various courts – military, civilian courts and ATCs – have been hung across the country. 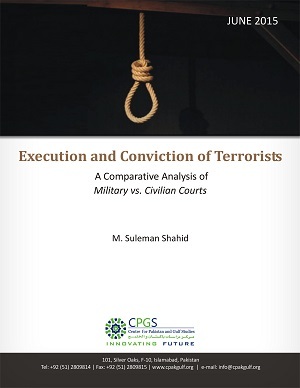 In this context, 33 percent of the convicted who have been executed were sentenced by civilian courts such as the session courts, district courts etc. Likewise, another 28 percent were convicted by the ATCs, and 7 percent from military courts via court-martials, while the convictions of another 32 percent could not be identified through the existent database of available sources. An eye opening report. Ironically people are emphasizing on establishing military courts to punish terrorists but ATCs are performing this job very well. most surprisingly only 23% terrorists have been hanged rest 77 % belonged to other criminal activities. NAP is failed to deliver the results. This was a pretty good analysis. Now kindly write about Indian Threats and Pakistan reply to counter them diplomatically, politically and military. i was searching out entire data, excellent job done by cpgs. state is on path of legal mass murdering! very informative and useful report. state should also hang also those people who belong to militants organization and who create anarchy and challenge the writ of the government. Writer pointed out those who were executed but he should also raise the issue of rest of the convicted people/terrorists. alongside the terrorists, government of Pakistan must punish all other criminals and traitors who are involved in conspiracies against our beloved country. Great Job M Suleman Shahid, Keep it up. Very Good topic and nicely written. How can I download this report?